There are many examples of warm-climate paleoflora and paleofauna found at high latitude or within continental interiors at mid latitudes in the scientific literature. One of the most outrageous is the “Eocene” trees, some upright and some not permineralized, found on Axel Heiberg and Ellesmere Islands in northeast Canada at 80°N, dated as “Eocene”.2,3 The paleofauna consists of salamanders, tortoises, alligators, and flying lemurs—all reinforcing the idea of a past warm climate. Such an interpretation seems to be confirmed by a recent analysis of deep-sea cores from the Arctic Ocean that concluded the Arctic Ocean was much warmer in the early Tertiary, ranging from 18°C to 24°C.4 These temperatures compare to an average Arctic Ocean sea surface temperature today of-2°C. Also found on Axel Heiberg Island was a tropical to subtropical crocodile-like reptile, which was dated as “Cretaceous”.5 The climate these fossils are assumed to represent has a warm season temperature of 25°C to 35°C with the coldest monthly mean temperature of 5.5°C. These temperatures are in stark contrast with today’s climate in the area that has an annual mean of-20°C and a January mean of-38°C. So, both the Cretaceous and Eocene would have been outrageously warm in northeast Canada. Dinosaur fossils have been found at many locations in the high latitudes, including Antarctica, Spitzbergen, northeast Canada, and northern Alaska.6,7 These warm-climate fossils have created a conundrum for uniformitarians, which they have dubbed “polar dinosaurs”. However, their climate model run for the late Cretaceous in central Siberia failed to give temperatures that matched the past warm climate. 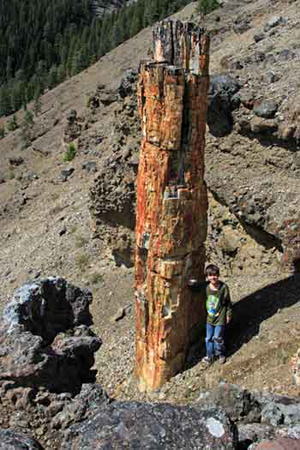 Four-metre tall petrified tree trunk vertical to layers of volcanic breccia at Specimen Creek, Yellowstone National Park, Montana. Spicer et al. document the paleoflora of the continental interior of the Vilui Basin, central Siberia, during the late Cretaceous, and suggest the climate was much warmer.1 From the fossils they concluded that the climate was wet, warm temperate, and more equable than today. An equable climate is one in which there is little difference between the seasons. Their computer comparison with various paleoflora and climates today resulted in an estimated mean annual temperature of 13°C, a warm-month mean of 21°C, and a cold-month mean of 6°C. Such a climate is radically different from the current climate in central Siberia. The main reason why high latitudes and the interiors of mid latitude continents are so cold today in winter and in the models, in spite of all the warming adjustments made to the models, is because temperatures in these areas are strongly correlated to the angle of the sun. For continental interiors the long distance from warm oceans is an additional factor. It seems impossible meteorologically to account for the presence of such warm climate fossils in these areas within the uniformitarian paradigm. During the Flood, the warm climate paleoflora and paleofauna would have been transported to high latitudes by strong floodwater currents in vegetation mats. 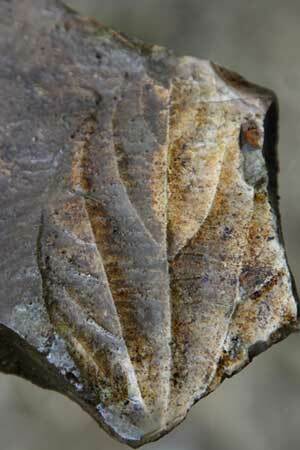 Well preserved leaf in one of the organic layers at Specimen Creek, Yellowstone National Park, Montana. There is a simple answer to the uniformitarian dilemma when you start with a biblical framework. Spicer et al. need to go no further than their first reason: “Systematic errors in the interpretation/calibration of the climate proxies.” And the reason for the errors is their dogmatic adherence to their uniformitarian assumption. 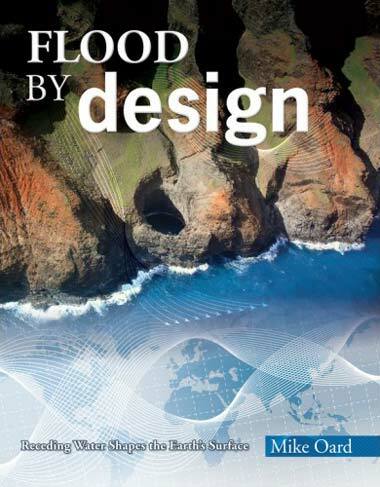 The Flood transported vegetation-mat model can solve most, if not all, the problems with the observations of warm climate fossils at high latitudes and within continental interiors of mid latitudes. It also accounts for the observed mixing of vegetation from widely divergent climates, as reported from some paleoflora sites. 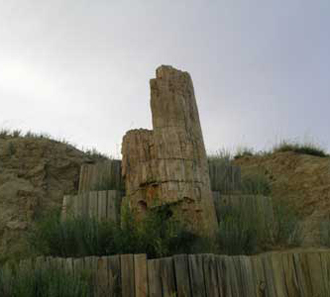 The model also explains the relatively common occurrence of fossil trees oriented in a vertical position, such as the one in the Powder River Basin east of Buffalo, Wyoming (figure 1). In regard to the Yellowstone “fossil forests” in Montana and Wyoming (figure 2), Dr Harold Coffin demonstrated that all the observations, including well-preserved organic horizons showing little or no decay (figure 3), can be modeled as a floating log mat in a large body of water.21 Such a deduction is consistent with a model of log mats forming during the Genesis Flood, which also implies that the Eocene Absaroka volcanics were laid down in relatively deep water during the Flood. Spicer, R.A. et al., The Late Cretaceous continental interior of Siberia: a challenge for climate models, Earth and Planetary Science Letters 267:228–235, 2008. Return to text. Oard, M.J., Mid and high latitude flora deposited in the Genesis Flood Part I: uniformitarian paradox, Creation Research Society Quarterly 32(2):107–115, 1995. Return to text. Oard, M.J., Cold oxygen isotope values add to the mystery of warm climate wood in NE Canada, Journal of Creation 17(1):3–5, 2003. Return to text. Moran, K. and Backman, J., The Arctic Ocean: so much we still don’t know, Geotimes 52(10):24–27, 2007. Return to text. Oard, M.J., A tropical reptile in the Cretaceous Arctic; paleofauna challenge to uniformitarianism, Journal of Creation 14(2):9–10, 2000. Return to text. 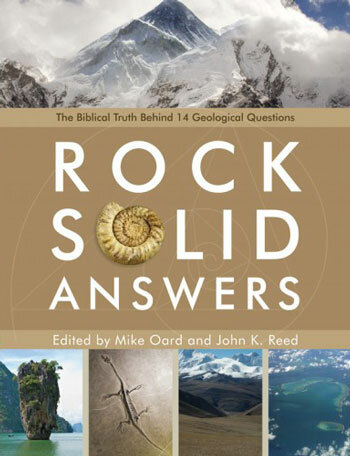 Oard, M.J., Polar dinosaurs and the Genesis Flood, Creation Research Society Quarterly 32(1):47–56, 1995. Return to text. Oard, M.J., Polar dinosaur conundrum, Journal of Creation 20(2):6–7, 2006. Return to text. Coffin, H.G., The Yellowstone petrified “forests”, Origins 24(1):5–44, 1997. Return to text. 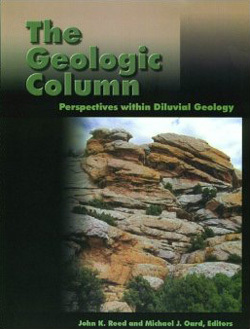 Oard, M.J. and Klevberg, P., Green River Formation very likely did not form in a postdiluvial lake, Answers Research Journal 1:99–108, 2008. Return to text. Hutchison, J.H., Turtle, crocodilian, and champsosaur diversity changes in the Cenozoic of the north-central region of western United States, Palaeogeography, Palaeoclimatology, Palaeoecology 37:149–164, 1982. Return to text. Markwick, P.J., “Equability”, continentality, and Tertiary “climate”: the crocodilian perspective, Geology 22:613–616, 1994. Return to text. Markwick, P.J., Fossil crocodilians as indicators of Late Cretaceous and Cenozoic climates: implications for using palaeontological data in reconstructing palaeoclimate, Palaeogeography, Palaeoclimatology, Palaeoecology 137:205–271, 1998. Return to text. Oard, M.J., Tropical cycad reinforces uniformitarian paleofloristic mystery, Journal of Creation 12(3):261–262, 1998. Return to text. Oard, M.J., A uniformitarian paleoenvironmental dilemma at Clarkia, Idaho, USA, Journal of Creation 16(1):3–4, 2002. Return to text. Spicer et al., ref. 1, p. 229. Return to text. Spicer et al., ref. 1, p. 228. Return to text. 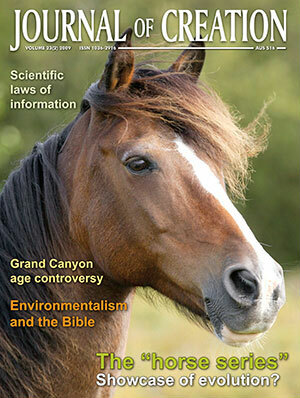 Oard, M.J., Global warming: examine the issue carefully, Answers 1(2):24–26, 2006. Return to text. Oard, M.J., Mid and high latitude flora deposited in the Genesis Flood Part II: a creationist hypothesis, Creation Research Society Quarterly 32(3):138–141, 1995. Return to text. It is highly unlikely that this vegetation grew in place after the Flood in a warm Ice Age climate, mainly because the climate implied by the paleoflora and paleofauna is much too warm, requiring rare below freezing temperatures in winter in those areas. Return to text. Obst, J.R. et al., Characterization of Canadian Arctic fossil woods; in: Christie, R.L. and McMillan, M.J. (Eds. ), Tertiary Fossil Forest of the Geodetic Hills, Axel Heiberg Island, Arctic Archipelago, Geological Survey of Canada Bulletin 403, Ottawa, Ontario, Canada, pp. 123–146, 1991. Return to text. Coffin, ref. 8, pp. 37–39. Return to text.